The National: A Facade of Silence from Detroit Sound Conservancy on Vimeo. 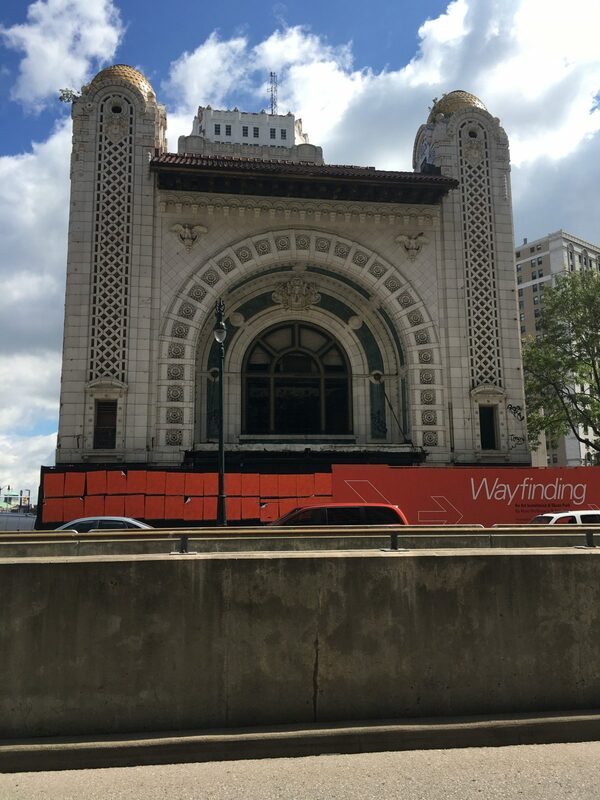 On Monday September 11th, the property management company Bedrock Detroit publicly announced their plans to demolish the National Theatre and move a portion of its façade to serve as a pedestrian walkway. On August 24, the first public kickoff meeting for Bedrock’s proposed Book Tower and Monroe Block development projects was held as part of the Community Benefits Ordinance (CBO). The goal of Detroit’s new CBO process, that was passed by ballot initiative last November, is to advise the developer of concerns within the community impacted by a proposed development. One of the buildings contained within the Monroe Block development footprint is the National Theatre, the last remaining theater designed by Albert Kahn and recognized nationally for its historic significance. Built in 1911 and the oldest remaining theatre in Detroit, the National was notably saved from demolition in 1990 while the other 12 of the 13 buildings in the Monroe Avenue Historic District were razed. It is now the last remaining building standing from Detroit’s first theater district. Beyond its architectural history we here at the Conservancy also know the National has a rich visual and sonic cultural heritage. Over a decade ago our dear friend, writer Sarah Klein, reminded us of that history in an article called Paradise Regained for Metro Times. 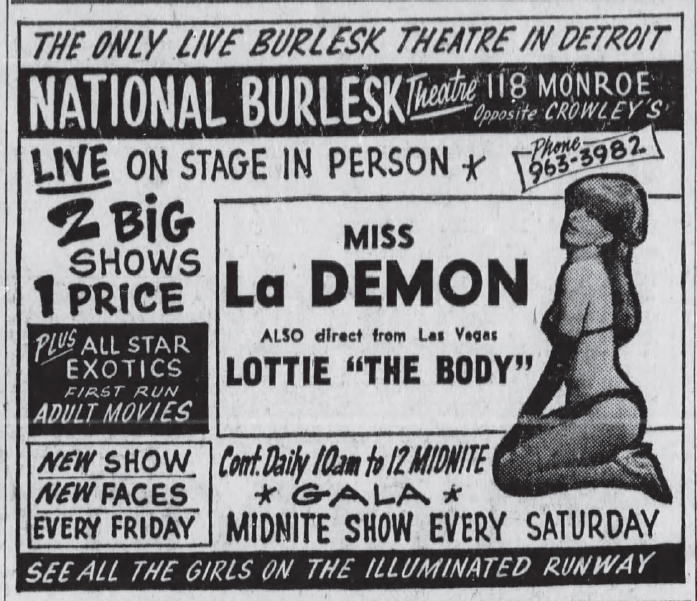 Originally a vaudeville house, the National later became “Detroit’s biggest and best” burlesque/burlesk theater. And just two weeks ago, Lottie “The Body” Graves told us at her home where we were interviewing her for our Detroit Sound Hall of Fame program about the importance of the National and how she wishes developers would renovate, not destroy, the National. The National is more than a pretty architectural novelty item which can be preserved by saving only its facade. Its demolition means not only the destruction of a unique last-of-its-kind historic building but also the erasure of a site of extreme significance in Detroit culture. Detroit is not a blank slate to be shaped into any one developer’s vision for the future. The National is an opportunity for Bedrock to engage seriously with Detroit’s rich musical and cultural heritage. If not now, when? As we prepare an excerpt from our oral history interview with Lottie to be presented to City Council, we ask our followers to be aware of this process and speak their minds. The City of Detroit still owns the National and City Council has yet to approve transfer to Bedrock. Thursday, 5:30 pm, September 21st at Coleman A. Young Municipal Center Auditorium, will be the last public meeting before the developer responds to community concerns and concludes the CBO process. Update 9/27: We have just found out that you can send comments directly to NAC via MonroeBookNAC@gmail.com – Final day to do so is 9/27. Update 9/28: Our video made Curbed Detroit. Read the article here. it will recommend that Bedrock PRESERVE The National AS A THEATRE. On October 12th we will get Bedrock’s response to this advice. Update 10/16: On October 12th, Bedrock explained that in its opinion The National could not be saved. 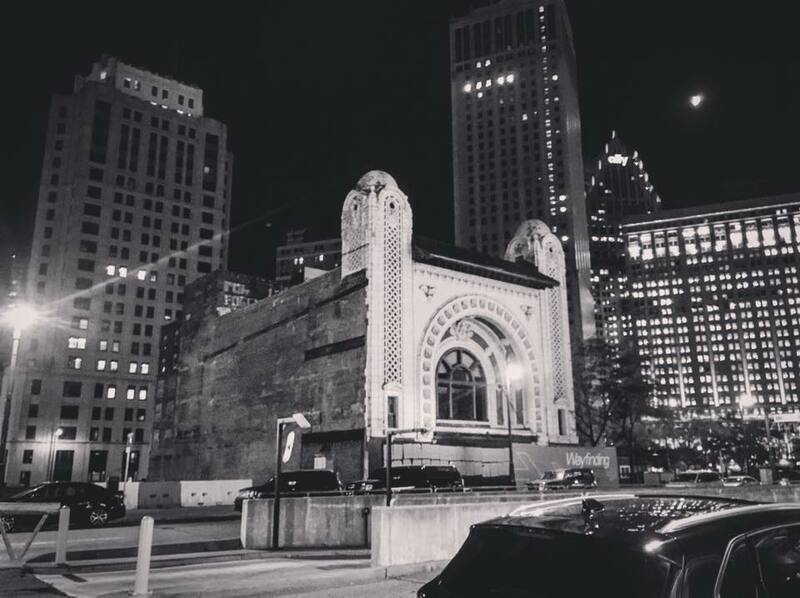 On Tuesday, October 17th, Detroit City Council will vote on whether to transfer The National to the DDA who will then sell to Bedrock. Once that is done the City will have lost any leverage it might have in pushing Bedrock to honor the recommendations of the Neighborhood Advisory Council to NOT demolish the building. Meeting starts at 10 AM. 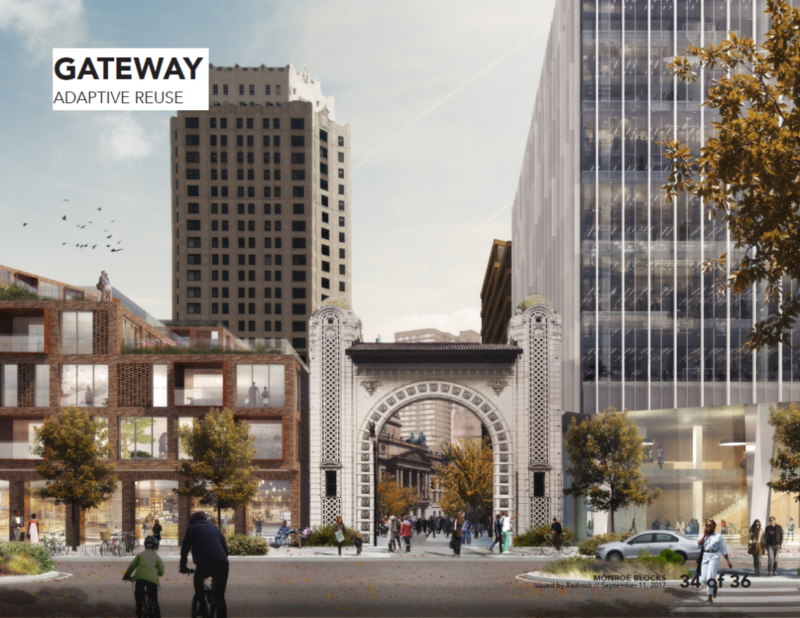 Update 11/9: Detroit City Council DID transfer The National to the DDA. with the potential exception of the facade. We are aware of no other legal hurdles for Bedrock. Other than further media exposure you may also wish to address your concerns you may have directly to the man himself, Dan Gilbert. We hear that he responds to direct tweets here. There is no need to move it, Restore it, it is a crime to tear it down,This Building is the only remaining Theater Designed by Albert Kahn. this is of National Historic Importance, you cannot convince me that it cannot be done. The Gratioit Central Market was devastated by a second fire in 1995, the only thing left of that building was the front wall the front façade, and the owners of that building invested millions in restoring it. It was built in 1915 the architects were Smith Hinchmen and grylls, the owners did not get any Federal money nor city money. I got the job to restore the tiles on the front of the building, after showing the owners one of the tiles that I stripped the paint off of that came off of the back wall that was destroyed. Buildings such as this that are restored, create tourist interest and attraction and show outsiders that we are proud of our city and our architectural heritage, tearing down the national Theatre is not only stupid and shortsighted it is criminal.